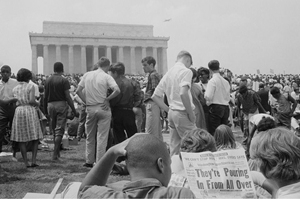 A crowd of African American and white people on the grounds of the Lincoln Memorial on the day of the March on Washington. Photographer: Warren K. Leffler. Ownership: Public Domain. Presiding over his class last semester, Leonard Steinhorn wanted students to visualize the carnage wrought by forces of bigotry, hatred, and segregation during the civil rights era. So he used clips from today’s popular video-sharing website YouTube to teach a lesson about an African-American boy murdered in Mississippi for allegedly flirting with a white woman. With the 50th anniversary of the historic March on Washington approaching, several American University academics acknowledge that teaching the civil rights movement can be challenging. Many AU students were born three decades after Martin Luther King’s rhapsodic “I Have a Dream” speech, and they live in an era mostly devoid of the riots, burning streets, and burning draft cards that characterized the 1960s. Technology has made teaching about King and his times much easier. The website for the award-winning PBS documentary Eyes on the Prize offers two hours of footage, including segments on the March on Washington and the Montgomery Bus Boycott. Early televised interviews with King and Malcolm X are on iTunes, and documentaries of King and organizer Bayard Rustin can be viewed on Netflix. And traditional research on the civil rights era is increasingly accessible, with more press clippings, photos, speeches, and primary documents available than ever before. History professor Allan Lichtman uses PowerPoint for students in all of his classes, he says, “so they can actually see the March on Washington; so they can actually see Bull Connor and his police forces; so they can see what Rosa Parks looked like.” Activists from that era are also finding creative ways to communicate with a younger generation: Rep. John Lewis, D-Ga., a speaker at the March on Washington and a Freedom Rider, recently published a graphic novel (the first volume of a three-part series) about his exploits. American University was quick to embrace King’s message and the wider civil rights movement when it started taking off in the 1960s. The AU Student Association recognized a new Civil Rights Committee in 1960. Four AU students took part in a King-led protest march from Selma-to-Montgomery in 1965. One popular course in the late 1960s, “University and Revolution,” sponsored speeches on campus by Ralph Abernathy, King’s close ally, and Black Panther leader Eldridge Cleaver. King’s widow, Coretta Scott King, spoke at the neighboring Wesley Theological Seminary in 1970. During this period, the Organization of African and Afro-American Students advocated for more black studies classes. Today, AU offers a minor in Multi-Ethnic Studies and a minor in African-American and African Diaspora Studies. Academics today describe AU students as highly engaged in the matter of civil rights. This is partly because AU—with its Washington, D.C. locale—has a politically active student body. Incoming senior Tyler Sadonis has been involved with the Freshman Service Experience, a group committed to community action and social justice. The FSE theme this year is “Reclaiming Our Dream: For MLK, JFK, and All Those Who Fought for Social Justice,” and the group has been using the #FSEDream hashtag on Twitter to encourage student participation on the subject. “The main idea behind it is getting students to kind of think forward as to what our generation’s civil rights movement is going to be,” Sadonis says. Professors say one way to pique students’ interest in the civil rights movement is to tie it to contemporary issues, such as immigration reform and gay rights. But lessons from the civil rights era aren’t easily transferrable to some issues that plague minority communities today. School of Public Affairs professor Robert Johnson has taught about mass incarceration in the United States, which has disproportionately affected African-Americans. The nation’s substantial progress on civil rights makes teaching about legalized segregation even trickier. “Students live in a period where they have a black president; they have black members of Congress, a black person on the Supreme Court. So they don’t see the broad exclusion that drove much of the civil rights movement,” Lusane says. Yet perhaps a little distance from a period marked by racial strife is healthy. AU government professor Steven Taylor remembers teaching about segregated public housing in Boston; the city spent extra money to place African-Americans in Mission Hill Extension and whites across the street in the Mission Hill Housing Development.